Ducklings can drown in large containers of water. Once the feathers are fully grown in, they will be fine. Wild baby ducks or ducklings are cared for very aptly by the mother duck. If the mother duck is not in the area caring for her ducklings, it is important to know how to feed them. Wild baby ducks should only be fed if the duck's survival depends on your intervention. 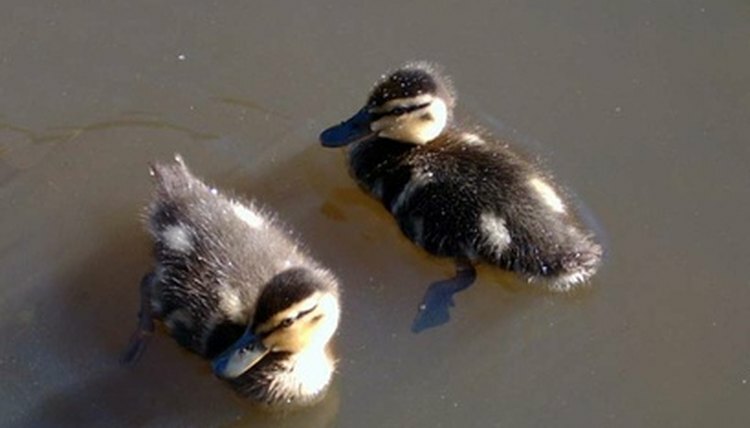 Certain foods, such as bread, can actually be bad for the ducks so it is imperative to learn what to feed orphaned wild baby ducks before starting. Ducklings that are newly hatched do not need food or water for the first 72 hours. During that time, the baby duck will receive nutrition from the yolk sac left from the egg. Purchase waterfowl or game bird starter feed called "starter crumbles." This can be purchased online or at feed stores and some pet shops. It is very important that it is non-medicated feed, as this type of feed can kill the ducklings. Ducklings should be fed a starter diet from the time they hatch to 2 weeks of age. The protein range is approximately 18 to 20 percent for the starter feed. Feed a grower diet when the ducks reach 3 weeks of age. Grower pellets are larger than the starter pellets and contain a slightly smaller amount of protein. Adding chopped greens or tender lettuce leaves to the baby ducklings' diet is also important. In the wild, the ducklings eat sea grass and vegetation as part of their natural diet. Provide fresh water at all times. Ducks cannot swallow food properly without water. Ducklings will naturally take some food then some water to wash it down. Martha Burg has been writing since her retirement in 2007. She has traveled extensively and resided in Germany for several years. Burg received certifications working with circuitry and electricity and assisted in writing training and procedural manuals while working in the telecommunications field for 20 years.